Egypt has been dominating news headlines recently–mass protests, journalists detained, all that jazz. While I haven’t been able to watch too much of Al Jazeera’s live coverage of this event, I did find myself asking “Why Egypt, and why now?” so here’s a little bit of research to try to answer that question. To understand Egypt, it’s important to understand the history and political background of the country. 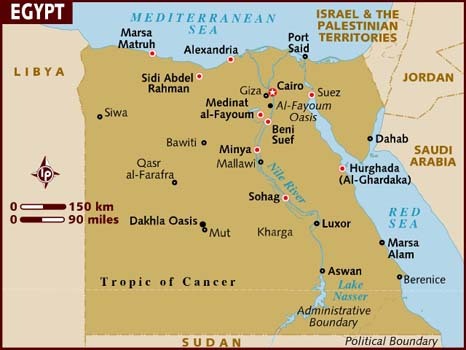 Officially the Arab Republic of Egypt, the country is located in north-east Africa. Egypt has historically been vital to commerce between Europe, Africa and Asia, due to its proximity to the Suez canal and transcontinental trade routes. Napoleon’s invasion of Egypt in 1798 rekindled Europe’s interest in Egypt, and by the 1850s, Alexandria and the gulf of the Suez region were connected via railroad. Fearing international and French influence as well as the vulnerability in the Suez, the British opposed the construction of the Suez Canal from construction to opening in 1869, but ironically enough, profited most from its opening, since it made the Indian Ocean and the Far East much more accessible than railroad. With the economic boost of the Suez trade, Britain quickly bought shares in the Suez Canal Company, becoming a major shareholder in Egyptian politics and government along with France. With the signing of the Entente Cordiale in 1904, Britain secured its control over Egypt, while France was given free reign over Algeria, Tunisia and Morocco. By World War I, Britain relinquished some of its control over Egypt, but only some. By the time World War I came around, Britain, one of the Entente powers, declared Egypt to be a protectorate, and closed the canal to everyone but allied countries. Even though Egypt was not at the frontline of the war, it did experience a disturbed peace: educated Egyptians began questioning the authority of the British over Egypt. 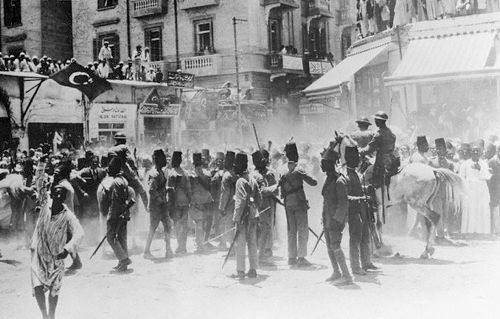 Seeing the example of the Ottoman empire, Egyptian nationalists protested to be handed over control of their own country. The British decided their best chance was to hand over the country to pro-British Egyptian leaders, and they finally gave Egypt ‘independence’ in 1922. But it wasn’t full freedom: Britain still retained control over the security of imperial communications, defense, the protection of foreign interests and of minorities, and Sudan. And this is where Egyptian nationalism traces its roots to. With President Woodrow Wilson’s emphasis on self-rule for all nations, Egyptians had decided in 1919 to organize al-Wafd, a delegation, to send to the Paris Peace Conference and negotiate colonization settlements. This group was jailed and sent to Malta, sparking riots and protests all over Egypt. The riots settled only after Alfred Milner announced to publicly cooperate with the leaders of the Wafd, specifically Saad Zaghlul, the most influential leader of the Wafd. But after Zaghlul negotiated the ‘independence’, he was imprisoned by the British and sent to the Seychelles, causing protests in Egypt all over again. Egypt was to be a constitutional monarchy, and the Wafd won by a landslide during the first elections in 1924, appointing Zaghlul as the Prime Minister. But when Egyptian extremists assassinated British Sir Lee Stack, the Zaghlul government was given an ultimatum by the British: apologize, punish the assassin, pay indemnities, and give unlimited control of Sudan and other foreign interests in Egypt to Britain. Zaghlul was forced to accept all but the last two conditions, and resigned from Prime Ministership in shame, much to the chagrin of Egyptian citizens. The Muslim Brotherhood remains the National Democratic Party's biggest opponent to this day. This feeling of humiliation was further propelled by the events leading up to World War II. As is often cited, the world suffered a lot from the Great Depression, and a lot of political parties emerged in response to political and economic turmoil. 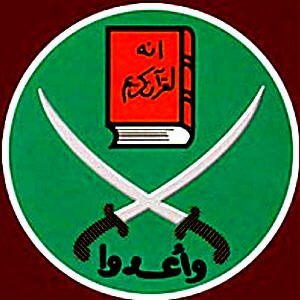 The roots of the Muslim Brotherhood, a fundamentalist organization established by Hassan al-Banna, lie here too. The young fascist Green Shirts (Young Egypt party) also emerged, and they favored beginning a new country along with Sudan. Monarchist sentiments were represented in the political arena under the leadership of Ismail Sidqi, who, as prime minister, abolished the constitution of 1930 and wrote a new one. In 1936, Britain and Egypt formalized their relationship in the Anglo-Egyptian Treaty, allowing Britain to maintain a military presence in the Suez Canal and control Sudan–a compromise that was resented by many. The Wafd government started falling apart by early 1940s, due to the public perception that they were allying with the British too much. Along with that, most British colonies and protectorates around the world were declaring independence, including India, Jordan, Myanmar, Sri Lanka and Pakistan. Then Prime Minister Mahmud Nuqreshi tried renegotiating the Anglo-Egyptian Treaty in this spirit, but Britain refused, sparking riots all over the country. Nasser, Egypt's most charming leader, rose to power in a military coup. During this time, pan-Arabism became a major political authority. In 1947, with the emergence of Israel, the League of Arab States came together to try to destroy Israel, but the Israeli army vanquished them. 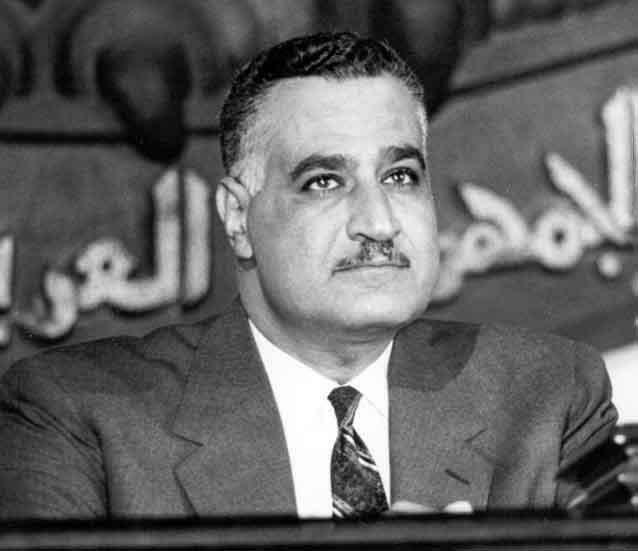 The first Arab-Israeli War in 1948, even though it was a failure, brought about the emergence of a new and publicly beloved leader in Egypt – Gamal Abdul Nasser. A proclaimed war hero, his strong rhetoric about pan-Arabic unity got him a lot of supporters initially, but he was more of a showman than an implementer–later rather than sooner, Egypt realized he was all talk, and by then it was much too late. Nasser took hold of the Egyptian state in a coup d’etat sponsored by his own Free Officers’ Movement, and his passionate anti-colonial spirit won him a lot of public support. By 1953, the FOM sponsored Revolutionary Command Council outlawed all other parties, and proclaimed the country as the Arab Republic of Egypt–a title that holds to this day. To his credit, Nasser tried. But his attempts to oust Britain from controlling the Suez Canal were not met favorably when the people found out Britain could take back control if Egypt was in crisis. He also led the Non-Alignment movement – a coalition of countries that didn’t side with either democratic or communist countries during the Cold War. But as the various Arab-Israeli direct attacks continued (War of 1967, War of Attrition 1968 – 1970, etc. ), little progress was made otherwise. When Nasser died of a heart attack in 1970, he was succeeded in 1970 by Anwar al-Sadat, who negotiated a temporary end to the war in favor of a future surprise attack against Israel. Anwar Sadat's peacemaking skills earned him respect, but also led to his assassination. 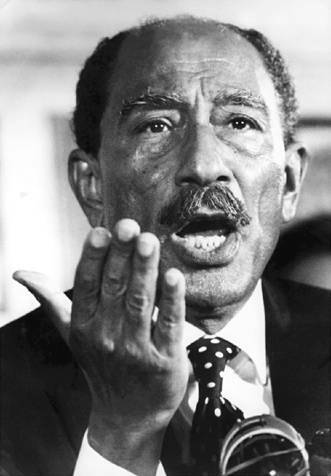 Despite Egyptian loss in the Yom Kippur War of 1973, Sadat was seen as a good leader, especially due to the the victories early on in the conflict. In Egypt, he was called the Hero of the Crossing, but he was a controversial leader still– he negotiated with Israel for the return of the Sinai Peninsula to Egypt and received a Nobel Peace Prize for it, but that very same action got Egypt kicked out of the Arab League. Politically, Sadat also undid the one-party socialist state Nasser had established, by mandating there be three parties representing the left, middle and right. Political parties were allowed to operate again, leading to minimal political freedom (or a lot, compared to previous years). But Sadat’s peace streak was short lived–after signing the Camp David Peace Accords of 1978, which established a framework for peace between Egypt and Israel, Sadat was assassinated by a military unit opposed to these negotiations. Hosni Mubarak, Egypt's president for the past 30 years. Sadat was succeeded by Hosni Mubarak in 1981, ex-VP and chair of the National Democratic Party in Egypt. He remains in power even today, but under suspicious circumstances — he has been uncontested in referenda (elections) in 1987, 1993 and 1999 and 2005, but presidential as well as parliamentary elections are typically characterized by low voter turnouts, fraud allegations and fudging of numbers. The NDP was a member of Socialist International, and was recently expelled in light of the protests in the Arab world. Mubarak also never removed the state of emergency that Egypt was declared to be under after Sadat’s death, citing violence and terrorism as reasons to keep the law in place. This law gives Mubarak the power to suspend human rights, imprison anyone for any period of time and ban demonstrations. Essentially, Mubarak has been running the country much like a dictator would. And people have had enough of it. Oppressive government, unemployment, inflation... need more reason? This is why the people of Egypt are protesting now. They have spent the past 29 years in a ‘state of emergency’, unable to express their views against an essentially single-party government. Their vote hasn’t mattered in years. Egypt is only ranked as “partially free” by the Map of Press Freedoms, mostly due to the fact that any news that is published/spread against the government meets state lawsuits, fines and prison time. Bribery and corruption is common, and the country ranks 101 on the international Human Development Index. Unemployment stands at about 10%, and the rate of inflation is soaring up at about 12% per year. Not to mention that about Egypt’s median age is 24–so a LOT of young people are frustrated with their government. The Egyptian government has taken these protests with a grain of salt. Cairo has been designated as a ‘war zone’, and the area of Tahrir Square, where most of the major protests are going down, is the epicenter of the violence. A curfew has been imposed, but isn’t being followed by the protesters, who are demanding that Mubarak resign NOW. 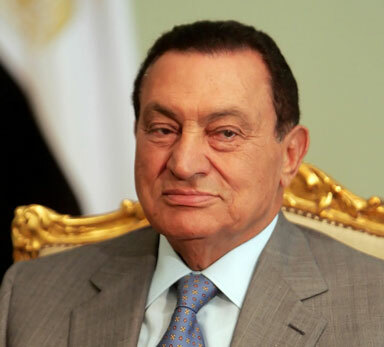 Mubarak is very conscious that if he resigns immediately, VP Omar Suleiman and the Egyptian military will control the state, and that may or may not be better than his own autocratic rule over the country. The government is much more nervous than military at this point–Vodafone announced that the government used its service to send pro-Mubarak messages to subscribers. Journalists and reporters are also being detained; press freedoms are being clamped down on more than usual. But Mubarak also blames the Muslim Brotherhood directly for the protests, and not his own government, which is infuriating protesters even more. They are demanding a national unity government–a type of coalition of all the parties that will function together and actually represent the people and their opinions. 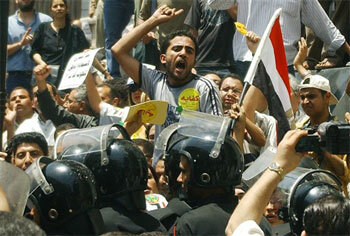 Friday, Feb. 4, 2011, is being called the ‘day of departure’, a culmination to the entire week of protests in the country. Why does any of this make a difference to US, you might wonder. Well, unlike Glenn Beck, I don’t believe the revolution is going to be exported to the US anytime soon, but it does have implications on our everyday life. Oil prices: being as dependent as we are on oil, the protests in Egypt are hiking up the price we pay. Although this is somewhat insignificant right now, the duration of these protests will dictate how much we pay at the pump for the next few months. International Relations: Egypt is the fourth largest receiver of US foreign aid, as well as millions of dollars in the form of military aid. We have been supporting them militarily since 1979, with an average of $815 million in military assistance. In return, Egypt has supported various CIA interrogations of terror suspects from around the world, and has also supported the war effort in Iraq since the Bush years. A change in the regime might change how the US’s rapport with Egypt, in terms of supporting our efforts internationally. If the people do elect a coalition government, many of the programs that we currently favor and need to run with Egypt’s support might not be implemented. Revolution is Infectious: Sure, it might not come as far as the US, but many other dictatorial regimes, especially in the Arab World, can learn from the Egypt uprising. After all, Egypt took Tunisia as its role model. Especially with the prevalent usage of Facebook and Twitter, messages, ideas and revolutions spread incredibly fast. What would this spell for countries like Syria, Saudi Arabia, Jordan, Algeria? So yeah. There’s my analysis of Egypt’s situation. We’ll know, hopefully within a few days, what the people of Egypt decide for their country. For more up-to-date coverage of this uprising, check out Al Jazeera’s live stream of events, or Ahram Online’s coverage.